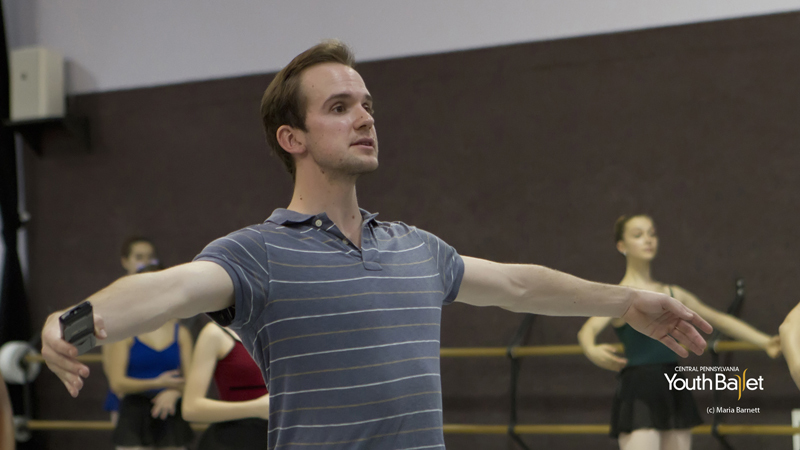 Jonathan Stafford, a ballet master with New York City Ballet (NYCB), former NYCB principal dancer, and a Central Pennsylvania Youth Ballet alumnus, guest teaching at CPYB. Full Circle. Familiar with the term? When something comes full circle, it pertains to returning to where one started after gaining experience or exploring new things. That defines exactly what former New York City Ballet (NYCB) principal dancer and CPYB alumnus Jonathan Stafford has done. With a tremendous want to give back, Jonathan speaks about his recent trip back to the school where it all started. Enjoy this reflective and inspirational read from guest blogger, Lori Myers. Full Circle: A life journey populated by family, teachers and audiences. Marcia Dale Weary, Central Pennsylvania Youth Ballet’s Founding Artistic Director, recalls Jonathan Stafford as a very well-mannered little boy, always conscientious, and a hard worker. Stafford hasn’t changed one bit. His life journey is populated by family who supported his talent, CPYB teachers who recognized it, and audiences who appreciated his showmanship and technical skills. Those visits from professional dancers left an impression. After watching how they shared their knowledge with young ballet students, it seems natural then that Stafford would follow in their footsteps and come home as artistic director for CPYB’s An Evening with Dancers from the New York City Ballet. Everything in his 33 years of life has led to this; a way, his way, of saying “thank you” to the school that prepared him for an astounding dance career in New York City. And what a career it has been. After beginning his training with CPYB at the age of eight, Stafford later entered the School of American Ballet (SAB), the official school of NYCB in 1997. He was then invited to become an apprentice with NYCB the following year and joined the Company as a member of the corps de ballet less than a year after that. In 2006 he became a soloist and then promoted to principal dancer in 2007. During those years, Stafford’s featured roles included an impressive array of both established and original works. 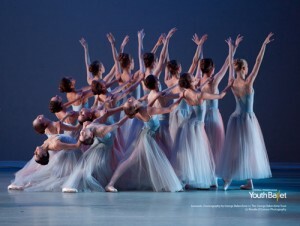 Favorites included George Balanchine’s “Tschaikovsky Piano Concerto No. 2,” “Serenade,” and Jerome Robbins’ “Interplay.” But in his usual self-effacing manner, Stafford admits that being front and center wasn’t always his main goal. His retirement last month after dancing in Balanchine’s “Jewels” at the David H. Koch Theater at Lincoln Center, was given a “hail and farewell” from the chief dance critic of The New York Times, Alastair Macaulay, who wrote “He (Stafford) has been among the most discreet, unshowy of dancers…” and “…the affable, manly good manners that he shows modestly onstage are abundantly evident offstage.” Stafford admits he was surprised at the accolades given to him by Macaulay. Stafford never set out to create an image of something he’s not: there’s no high drama on display, no unrealistic demands being made, no false notes. He simply has a passion for life and dance and appreciates the opportunities he’s been given. He has always done the work, exuded camaraderie, and treated everyone with respect. Now part of his legacy includes the act of giving back, such as when he had been asked by Peter Martins several years ago to organize the Dancers’ Choice program and raise money for the Dancers’ Emergency Fund used to pay for anything from hospital bills to furniture if a dancer’s apartment was robbed. Stafford organized the publicity – from posters to postcards – to try and fill the 3,000 seats for the show. He picked the dancers who were more than willing to assist Stafford in his efforts. It was a success. Stafford and company ended up raising $100,000 for the funds plus the $75,000 needed to pay for the performance. Writer’s Note: An Evening with Dancers from the New York City Ballet included a special student-only LEC/DEM for more than 390 students in the CPYB 5-Week Summer Ballet Program hosted by Jonathan Stafford. Check out photos of this exciting #CPYBsummer program on the July 1 CPYB Facebook post. Lori M. Myers is a Harrisburg-based award-winning writer. Her articles have appeared nationally and regionally in The Burg, B Magazine, and WITF’s Central PA Magazine where she had written about the Central Pennsylvania Youth Ballet.